Radial fissures on the flanks of the basaltic-andesitic San Miguel volcano have fed a series of historical lava flows, including several erupted during the 17th-19th centuries that reached beyond the base of the volcano on the north, NE, and SE sides. The SE-flank lava flows are the largest and form broad, sparsely vegetated lava fields crossed by highways and a railroad skirting the base of the volcano. The location of flank vents has migrated higher on the edifice during historical time, and the most recent activity has consisted of minor ash eruptions from the summit crater. A large lahar occurred on 26 August 2000 and damaged houses and a highway north of the volcano. On 6 September 2001, another lahar damaged a highway. A small eruption occurred on 31 December 1997 and produced minor ashfall. 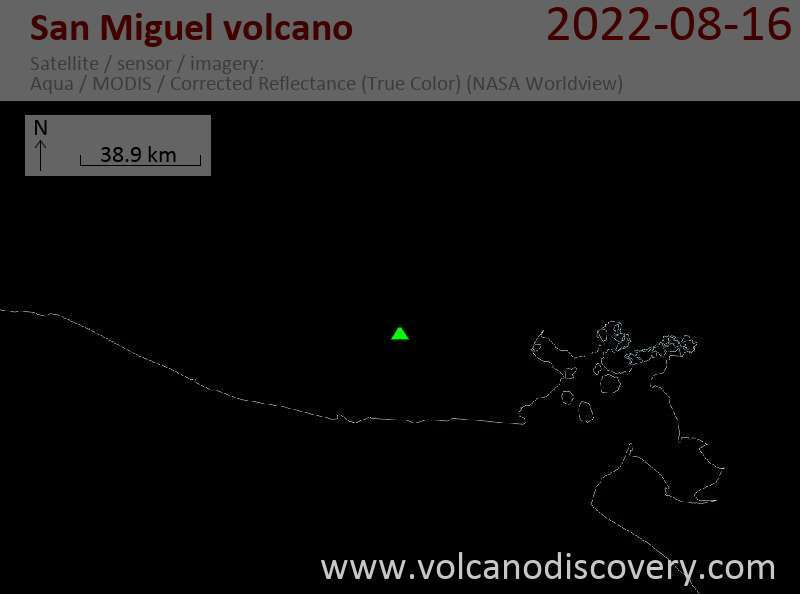 After 6 years of dormancy, San Miguel started erupting on 2 December 1976. The eruption built a new spatter cone in the central crater and continued until 12 December. It paused for 56 days and resumed on 28 February the following year and ended on 1 March. An eruption of San Miguel volcano started on 30 March 1970 and lasted until 4 April. It consisted of small ash emissions, sometimes accompanied by loud explosions. The first ash eruption could be heard 4 km away and produced an ash plume rising 400 m above the crater. Light ashfall occurred at up to 10 km distance.